San Francisco’s architecture has been changing so fast in the last few years it is hard to keep up. Millennium Tower built in 2005 has become our own leaning tower. Salesforce Tower has changed the skyline irrevocably but it isn’t all it’s cracked up to be. with the cracked steel beams that closed the transit center until they can be replaced. Faulty construction along a fault line is usually a cause for concern. On April 18, 1906, the great earthquake and fire irredeemably changed the look of San Francisco at the turn of the last century. Since then technology and retrofitting has made buildings that are safer and able to ride out a quake. There are a few splendid survivors of '06 and our Shake and Bake Tour tells their stories along with some of the human stories of this singularly earth shaking event. AJ, the FOOT! Tour Diva will touch on architecture both pre and post quake during our Shake and Bake Tour which includes the usual FOOT! fun and games. Join FOOT! 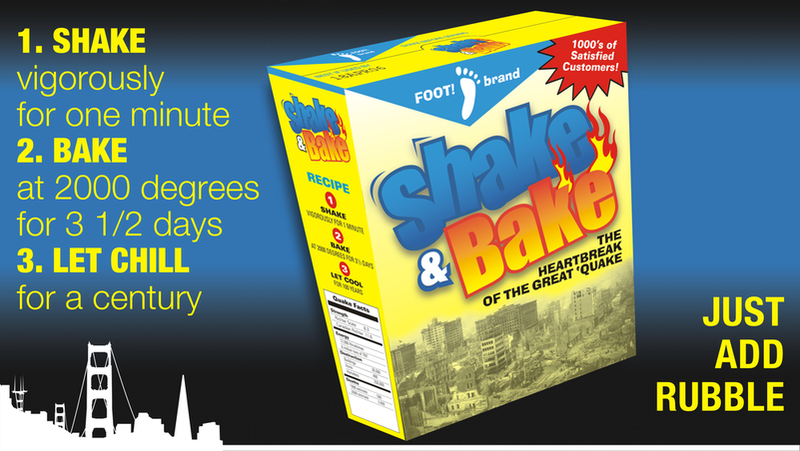 on our April Tour of the Month - Shake and Bake and receive $5 off the regular price of the tour. As always a portion of the profits from our tour of the month will be donated to our furry friends and their friends at the SF SPCA. For over 150 years this San Francisco institution’s mission has been to end animal abandonment, and you can learn more about the SF SPCA, or to donate directly to them here. Evacuation of San Francisco by Sea by William Alexander Coulter Image courtesy of the Musuem of the City of San Francisco.